Updated February 15, 2017 at 9:00 am: Per passenger values for revenue, expenditure and subsidy have been added on both absolute and inflation-adjusted bases. Updated February 14, 2017 at 1:00 am: Inflation adjusted versions of the charts have been added to this article. This morning’s Toronto Sun brought an opinion piece from Mayor John Tory about all of the wondrous new spending we would see in this year’s budget, and how our transit system would be better for it. Tory made several claims giving the impression that a great deal is happening, and that spending is just rocketing ahead under his leadership (not to mention TTC Chair Josh Colle). Now there has been some misinformation out there about the 2017 budget and the TTC so I want to be clear and set the record straight. The 2017 budget does not decrease TTC service and it does not cut any bus or streetcar routes. That is true as far as it goes, but the Mayor neglects to mention that the budget does not increase TTC service either. Indeed, if the TTC were actually able to use all of its bus fleet on bus routes, rather than making up for the shortfall in new streetcar deliveries from Bombardier, they would not have the budget headroom or staff to drive and maintain the additional service. Running 800 subway cars, 200 streetcars and 1,900 buses to transport 544 million riders this year. Providing funding to carry 1 million more Wheel-Trans passengers than last year. Giving more powers to Transit Enforcement Officers to help keep traffic moving, freeing up police resources for where they’re needed most. Finishing the rollout of Presto across the system. Upgrading signals on Line 1 so we can run subway trains more frequently and more reliably. Opening the subway extension to York University. Continuing the opening of the subway earlier on Sundays. Keeping the provision for kids to ride free on the TTC. Continuing work on the Scarborough Subway Extension. Providing essentially the same level of service in 2017 as the TTC operated in 2016 is not an addition, it’s merely keeping the lights on. The budget contains no funding for service increases on the “conventional” system. Wheel-Trans will see substantial growth in riding over coming years, and about $30m of the new money addresses that growth. 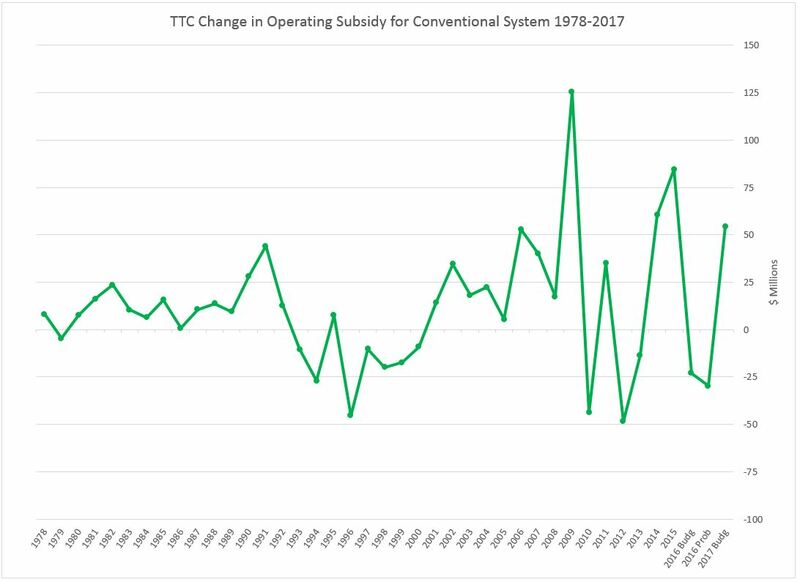 Better WT service is long overdue, but don’t let new spending on that part of TTC operations hide the fact that regular bus, streetcar and subway routes will see no change. Indeed, crowding on the conventional system is cited by some advocates as a disincentive for people to move away from WT, or to use the conventional system for part of their journeys. Added funding for Transit Enforcement is one of the few places where the TTC received funding for a net new service in 2017. However, looking city-wide, this is really only a transfer of duties from the police who get to show a saving in their budget. If we are serious about using transit constables for traffic management, the actual amount of spending needed will be considerably greater, and Toronto will have to take seriously a commitment to “transit first” on the roadways. The TTC is not buying 783 new buses in 2017. The number is actually a bit over 300 according to the TTC’s 2017 customer charter (see Q4), and these are replacements for old buses that will be retired. They do not represent a net increase in the fleet to provide more peak service. Moreover, they are paid for from the capital budget, not operating, and the $80 million cited by Tory has nothing to do with this purchase. Finishing the rollout of Presto. Oh dear, oh dear. Wasn’t that supposed to happen in 2016? Will the TTC ever have a serious discussion about fare options, the mix of subsidies and possible revisions to transfer rules, or will they simply operate as if people were still paying with tokens that have morphed into green plastic cards? During the 2017 budget debates, the TTC proposed that various discount fares could be abolished as a way to increase revenue and offset their deficit. This scheme was torpedoed by the Mayor, but the idea is still on the table and will likely resurface for the 2018 budget. Upgrading signals on Line 1 for more frequent service? Again this is a capital, not operating, expense, and this project will not be completed until 2019 with better service to follow, eventually. That added service would entail a higher operating cost (and subsidy), and Toronto will have to pony up the funding on top of any other increases. None of the $80m has anything to do with this. Opening the York University extension. Well, yes, although it actually does go to Vaughan, and Toronto is on the hook for paying to operate that line even in York Region. The net cost of this extension, after new fare revenue, is pegged at $7m in 2017 (mainly for startup costs) and a further $23m (for an annual total of $30m) in 2018. Continuation of “early” Sunday openings on the subway, and associated early service on bus routes, is not an “investment”, but rather a continuation of an established service that nobody, at least until now, ever thought was threatened by budget cuts. This service began at the start of 2016, and so there is no marginal cost (year over year) to continue this in 2017. Similarly retaining free rides for children does not represent a new cost for the 2017 budget, and hence no new “investment”. And finally, the Scarborough Subway Extension, whatever one might think of it, is a capital project, not part of the operating budget. The funding allocated to it in 2017 is actually quite small because at this stage only planning and very preliminary design are underway. “$80 million is by a long shot the largest single year increase we’ve ever had”. Sadly, that is incorrect on two counts. First, as I mentioned above, about $30m of that increase is for Wheel-Trans subsidy which is normally treated as a separate item when talking about TTC budgets. Conflating the conventional and WT increases makes the benefit look bigger than it really is. More to the point, however, the statement is simply wrong. 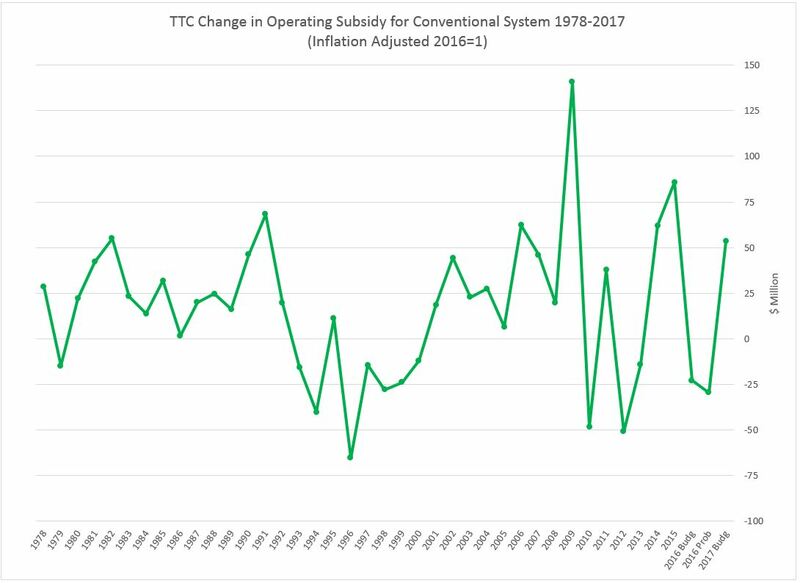 The largest year-over-year subsidy increase for the conventional system was between 2008 and 2009 when the subsidy went up by $125.4-million. Why the big jump? 2009 brought in the Ridership Growth Strategy and a commitment to improved transit. This was undone during the Ford era and has only partly been restored under Tory. 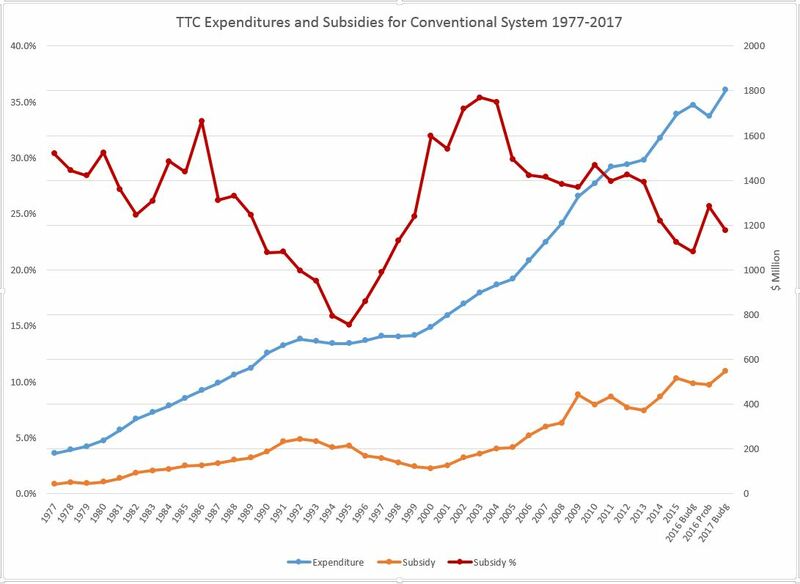 The chart below shows the growth in total operating expenses for the conventional system over the past 40 years (blue) together with the dollar value of the operating subsidy (orange) and the percentage of expenses covered by subsidy (red). The original set are the approved City Budget numbers. The second set is the “probable actual” results reported by the TTC. Note the drop in projected expenses for 2016 compared with actual results for 2015. This is a result of the cutbacks imposed to rein in costs in the face of less than anticipated revenue. 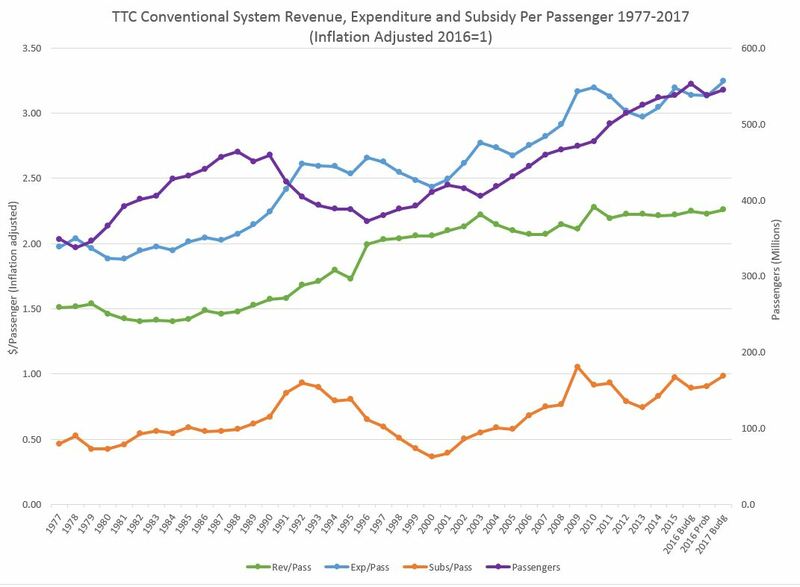 This is the largest year-over-year decline in TTC spending over four decades, and it is not a tribute to the City’s commitment to transit. There is a very large projected growth in expenses for 2017 relative to the 2016 budget ($67.5m) and even more relative to 2016 probable ($108.9m). However, little of this will show up as additional service on the street. This situation is a bizarre, but not unexpected side-effect of a budget year in which cut-cut-cut is the only topic of interest at City Hall. TTC management have planned to bring out a “Ridership Growth Strategy” report, but this is on hold due to budget concerns. A constant problem for transit and other budget areas at the city is that we rarely hear about what could be done, and how much this would cost to implement, only that it is time, again, to cut spending in the name of “efficiency”. One important point about 2015 is that the operating budget included some “capital from current” spending that was stuffed in at the last minute to accommodate Mayor Tory’s announcement an accelerated bus purchase. This shows up as an “operating” subsidy although it really is a capital expense. Ironically, the TTC has never received full funding to actually operate these extra buses. The annual changes in subsidy levels have bounced around over past decades with a big drop for the recession of the early 1990s. When the financial information is stated on a per passenger basis, we can see both the changes in the cost of providing service and in the subsidy each trip receives. The chart below shows the total passenger count for each year (purple) and the associated per passenger values of revenue, expense and subsidy. Note that “revenue” includes miscellaneous items such as advertising, commuter parking and rentals that collectively amount to about 4% of TTC income. The passenger count peaked in 1988 at 463.5 million, and then began a decline through the 1990s recession bottoming out in 1996 at 372.4m. The 1988 peak was not overtaken until 2008 with its ridership of 466.7m. Expenditures per passenger (blue) climbed generally, but they dipped in the late 1990s, the Harris era with provincial funding cutbacks, and the Ford era. Revenue per passenger (green) has climbed consistently with a few dips corresponding to fare freezes. Subsidy per passenger (orange) fell through the 1990s bottoming out in 2000, and then grew to a peak in 2009 corresponding with the introduction of the Miller-era Ridership Growth Strategy. The value then fell through the Ford years, but is now back to a record level (without allowing for inflation) in the 2017 budget of $1.01 per passenger. When these data are adjusted for inflation, the picture is somewhat different. Expenditure per passenger has had periods of growth, notably the late 1980s and the first decade of this century with a peak corresponding to the RGS implementation. The value then fell during until recent years. 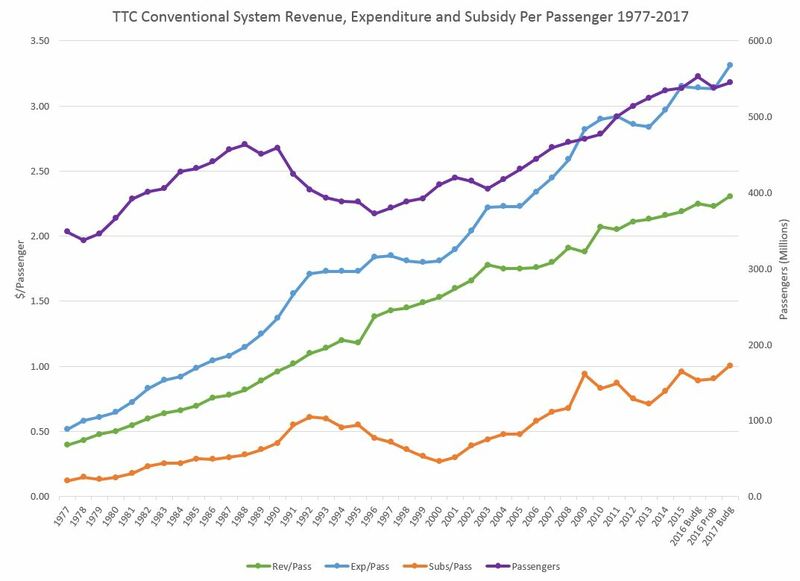 Revenue per passenger took a big jump at the point where provincial subsidies were eliminated in the 1990s, but the value has only grown slowly over the past two decades when inflation is considered. The subsidy per passenger bottomed out in 2000 and hit a high in 2009 (RGS), a point from which it has not yet recovered although the numbers have improved since a recent low point in 2013. The charts above are available as a PDF. Thanks again for doing all this. I don’t read the Sun, so I’d never even have heard of this piece. Steve: I have a few thoughts about additional info for this article, and I will include this in the hopper. 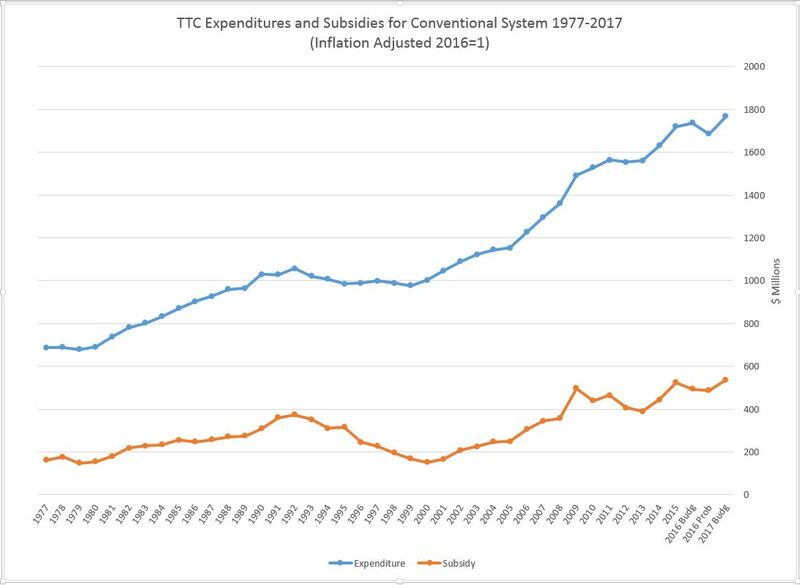 One problem is that many of the cost inputs to the TTC’s total budget are affected by different factors than the overall rate of inflation. Notable among these are service adds and cuts, but also fuel and energy costs which form a different proportion of overall costs than they might do in the general basket of good making up the inflation index. The Sun article formed the basis for an announcement by Mayor Tory at Broadview Station this morning. $80 million? If it were the 1960’s, then yes. But it’s 2017! Heck, this past week’s Lotto Max was $60 million! For a regular human, that’s a big amount, but for the TTC it’s peanuts. @Steve: In other words, you are accusing John Tory of blatantly lying as your article implies? Steve: The phrase one uses in diplomatic circles is “The Mayor was badly advised”, but yes, he was telling porkies. There is a good chance that he doesn’t know any better, but that doesn’t say much for having one’s hand on the tiller. When you make statements like this, the buck stops with the guy shooting off his mouth, not the poor schmuck who wrote the speech/article. I’m readily confused by all of the stats and claims and am glad there’s a relative rock of truth from Steve, thanks. Having too much elasticity with important figures is costly to us all, and we are seeing too much mathemagical thinking with the Suspect Subway Extension numbers, and also the claims about the Smart Track are proving to be far less than what was promised, and odds are will cost us too. Not that other levels are fully ‘on’ with their numbers – the UPX model for riders hasn’t worked out quite like it was supposed to, and one suspects that the Sorbara subway extension will also be another ‘oop$’ for the taxpayer and transit riders. But really wish we’d get focussed on how much automobility is costing us and compare that with the transit. If we accept a figure from Vancouver 20 years ago of $2700 per car each year of avoided cost/subsidy, that’s about $2.7B – enough to make most of us quite accepting of a now-Suspect Subway Extension in to Scarborough as one example of a project that there’s a bit of rationale for, just not now with all the limits on our fundings from the blindness to the car costs and unwillingness to get close to the level of user pay for them as transit users have. The latest example is Mr. Tory asking the province for $$$$ for Gardiner and DVP absent the permission for tolls. These are not public roads; only those with motors attached can use them, so it’s entirely fair to have most costs paid for by motorists, hence the absence of a Vehicle Registration Fee – clearly immediately possible if the civic political will existed – must make the province kinda laugh at the Mayor being caught ‘short’, And if it is two roads is it ‘shorts’? It will be interesting to find out if there is any truth to Andy Byford leaving the TT&C for Australia! Never figured him for a long term head man. Maybe his is fed up with trying to make the TTC work like it should. I would argue Steve, that you are correct the CPI would not be an appropriate measure to use. However, over a longer term the GDP deflator, or a producer price index (PPI) would be very good proxies. The energy component while it varies wildly within used to (have not looked very recently) average back close enough, that it would help allow for wages and other things. However, also of note, today, the PPI since 2000 has risen notably less than the CPI, because of currency devaluation. You are correct that adjusting for a reasonable inflation is important, because a subsidy increase of 80 million needs to be considered in the scope of the total expenditures, the current shortfalls, and what services the city wants to offer. If you think in terms of 2% inflation and a 400 million dollar subsidy, that is an increase of 8 million each and every year to hold position of the subsidy, no consideration for service increases, no consideration for operating conditions etc. If you missed 4 years of increases, or had decreases, that means 32 million missed but fill the hole of decreases. If you are adding 30 million in net costs due to new subway operating costs well, that would mean 62 million required to get you the point of where all you need to fill is Ford cuts. Or perhaps tired of being stuck between calling his boss out or lying. There appears to be a real gap today, where fixing the TTC really requires some difficult choices, beyond just kicking the can. It is painfully evident, the choices that are being made above an operational level have little to do with making transit work, and really deliver service, and are all about budget, and pandering. The reality that subway extensions are not viable, is something that the politicos, and voters need to appreciate. The reality that actually fixing service, means getting more of it out of traffic. The reality of making the city works, means serving the grid better, so that people can make the choice to ride not drive to the destination they need to go to, from the origin they are actually at. If I was in charge of the TTC, and was faced with knowing that I would not be allowed to make required significant operation changes in terms of how the dispatch and tracking systems worked, or get substantial and easy cooperation on signal priority, and could not drive the evolution of the system to create capacity and service I knew was required, I would likely have an active job search going, and be quietly biding my time and saying little for fear of destroying other career options. I suspect that if he is the operator he appears to have been previously he has likely concluded that he will not be allowed to place more than a band-aid on an arterial bleed. If I were him, I would not want to be the doctor of record. Further to the problems mentioned by Malcolm, Mr Byford must be on the verge of either an extended laughing fit or a complete breakdown over Bombardier’s statement that they will deliver 40 Flexities to him this year. In the first month and a half they have managed one. That means that they will build almost one per week for the rest of the year. Bon chance! Steve: The delivery schedule for 2017 does not ramp up until later in the year as more production capacity comes on stream. The intent is to ramp up to about two/week in October. Will Bombardier manage this? We will have to wait and see. Meanwhile, plans for the next few months don’t bring us many new cars, and the second of the year (4432) is already enroute from Thunder Bay. They are “on time” to their plans. What is delaying the startup of added capacity at Bombardier for Flexity cars? Steve: The new lines are supposed to be ramping up for deliveries in the summer and fall. I do not know what the time from start to finish of a car is, and therefore don’t know how long after a new line exists cars will start popping out at a faster rate. It would not surprise me if more than one supply chain issue has to be solved, not just production capacity for assembly.